Meet High School Art Student Luis Gonzalez, and Hear About How Art Transformed His Life! Art classes allow young people to express themselves in important ways. Unfortunately, arts education is disappearing from schools in America; since 2008, 80% of school districts have cut funding for art programs. Simultaneously, student creativity scores have dropped. Fortunately, there are people and groups out there fighting to keep arts education present and vibrant in schools across the country. One of those pro-arts fighters is LIFEWTR, a premium bottled water brand committed to advancing and showcasing creativity. 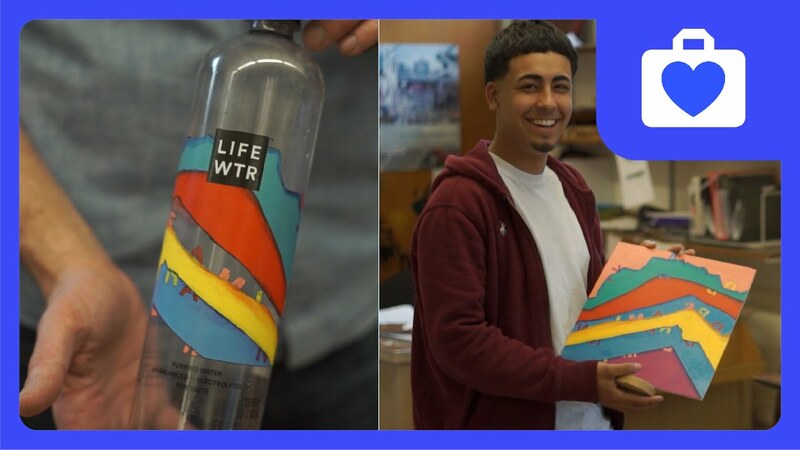 By inviting young artists to submit work for a high-visibility canvas—their bottles!—LIFEWTR hopes to inspire a new generation of young artists devoted to drawing, painting, design, and more. LIFEWTR Series 4 water bottles are decorated with the works of three young artists, each of whom demonstrates the far-reaching impact and positive influence that art can have on young lives. The artists are all young people from varied communities: KRIVVY from Toronto, David Lee from Los Angeles, and Luis Gonzalez, a Boston native who's featured in this video. Luis is a high school senior. He describes growing up in the Dorchester neighborhood of Boston as "nothing too easy." Because of this, Luis considers himself lucky to have found a passion for life and inspiration to stay in school, thanks to the lessons and mentorship he received in his art classes. For Luis, art was more than just a way to express himself; it was a "life-saver." Under the guidance of his art teacher and mentor, Ari Haube, Luis began to bring his unique point of view to life through drawing and painting. He "finagled" his way into getting extra hours of art classes each week, and was able to find art and inspiration in everything around him. Ultimately, his commitment to creating art that reflected his life led to his partnership with LIFEWTR; the piece he created for the bottles includes the word "DAYDREAMER," which is how Luis views himself. Luis tells us that he hopes to incorporate art into his professional career. In the future, he'd like to teach young people that art can open doors—as it did for him. This HooplaHa original video was produced by Dani Guitelman, shot by Manx Taiki Magyar and Dylan Steven, and edited by Kellie Sieban. To watch more stories of resilience and creativity, visit the HooplaHa YouTube Channel.